Who knew the ancient world could be so funny? This collection of cartoons was taken from the archives covering 26 years of publication of Pompeiiana, a newsletter devoted to student-developed material. Popular topics for the cartoons include Medusa (e.g., her chicken-haired cousin), Julius Caesar (e.g., Caesar reforms the colander), the Trojan War (e.g., Ulysses getting a Trojan warrior to shout his comments thus making the Trojan hoarse) as well as commentary on Caligula's horse in the senate (always voting "neigh"?) and Horatius playing cards or Horatius at bridge. Visit: Pompeiiana Newsletter blog. The Pompeiiana Newsletter was created and edited by Bernard Barcio and ran from 1974 through 2003. Pompeiiana offered a place for Latin students to publish comics, stories, games, and articles, and was a beloved resource for Latin teachers. In 2008, Barcio granted Bolchazy-Carducci Publishers the rights for all of Pompeiiana. This blog will make all 229 issues freely available to Latin teachers, students, and others interested in Classics, one issue per day. When In Rome Marie Carducci Bolchazy Bolchazy-Carducci Publishers 1570 Baskin Road, Mundelein, IL 60060 9780865167179, $9.99, www.bolchazy.com Published from 1974 to 2003, 'The Pompeiiana Newsletter' was edited by academician Bernard Barcio and featured as comic relief a variety cartoons by diverse contributors. Marie Carducci Bolchazy has now compiled those cartoons into a single volume and with the publication of "When In Rome: Best Cartoons Of Pompeiiana" has made them once again available to a new generation of readers who will appreciate humor stemming from the academic community who primary interests lay in the study of the ancient languages, cultures, mythologies and histories of the Greco-Roman era. 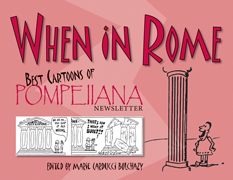 A pleasure to browse through, "When In Rome" is an especially recommended browse and a lot of great cartooning by amateur enthusiasts with a distinctive sense of humor.